We finally collected the Underground GTO from Sitech Racing today and headed straight for Hypertech to put it on the Dyno. 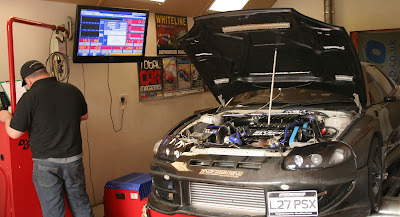 This is the first time the car has been on the dyno since it was fully rebuilt by Sitech and Simon had estimated we would see a power figure of 475bhp. The first run showed a figure of 538.9bhp at 21psi on 95 RON fuel. AFR was very conservative at around 10.5:1 so we're really happy with the result... for now! The funniest part of the day was probably watching live dyno feed on the tv screen during the first run. 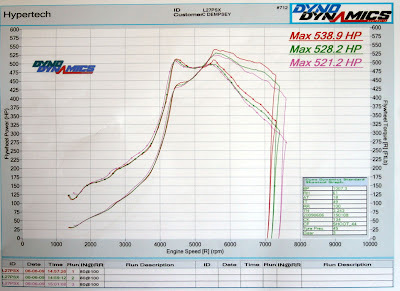 Apparently the dyno operator had said to Gav he'd just set the scale at top the chart to 450bhp. The moment the car reached 4000rpm the power trace shot straight off the top of the screen.